Last year, on my last day in New York, my Mum and I saw a Broadway show. It was Once - the award winning film. And it was one of my favourite things about my trip away. 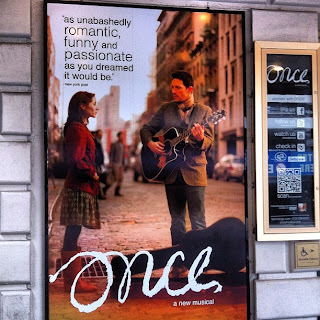 Once, written by Glen Hansard, who also stars in the film with Marketa Irglova (they were in The Swell Season together), is about an Irish busker/vacuum cleaner technician who falls in love with a Czec pianist. it is a beautiful story, complemented by music that both Hansard and Irglova write and play.It features the beautiful song Falling Slowly, which you may be familiar with. The stage was set up as an Irish bar so before the show, audience members could buy a drink. The performance was so lively, so uplifting, and I felt the music in my bones. The live Irish music was played so well. It felt like we were at a pub, watching a scene at a bar. I preferred the live performance to the film. Absolutely mindblowing. And I had 'Falling Slowly' in my head the whole flight home. 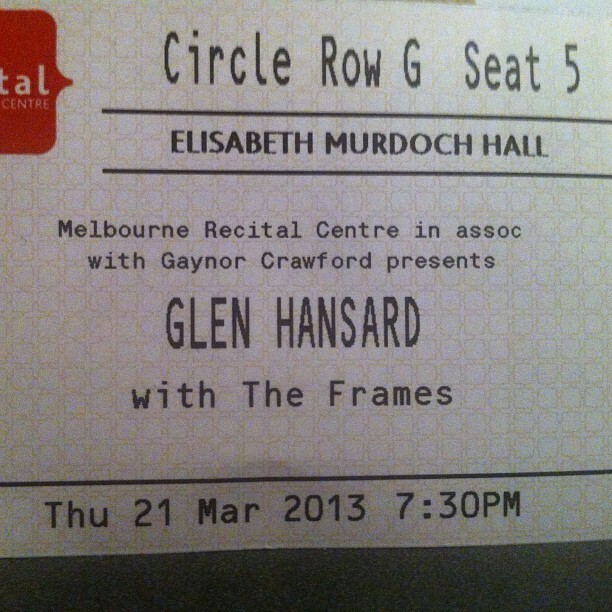 So when I saw that Glen Hansard and The Frames were playing in Melbourne, I had to buy myself a ticket straight away. Glen Hansard was supported by Irish singer Lisa Hannigan, whose voice was a bit like Lisa Mitchell. She later supported him on a few songs, including a Woodie Guthrie cover of which neither of them could remember the lyrics and so giggled hysterically. I sat behind the gorgeous Julia Stone at the show - I had a chat with her during the break between Lisa and Glen. The Melbourne Recital Centre was so beautiful, and my photos don't do it justice. I had previously been there when I won a Yooralla Media Award. At one stage, Glen spoke about how imposing a venue like the Recital Centre can be, and encouraged us to relax and have fun. I went into the concert not knowing many songs - I do have The Swell Season CDs and the Once soundtrack and DVD - and came out wanting to devour everything Glen Hansard and The Frames had ever made. 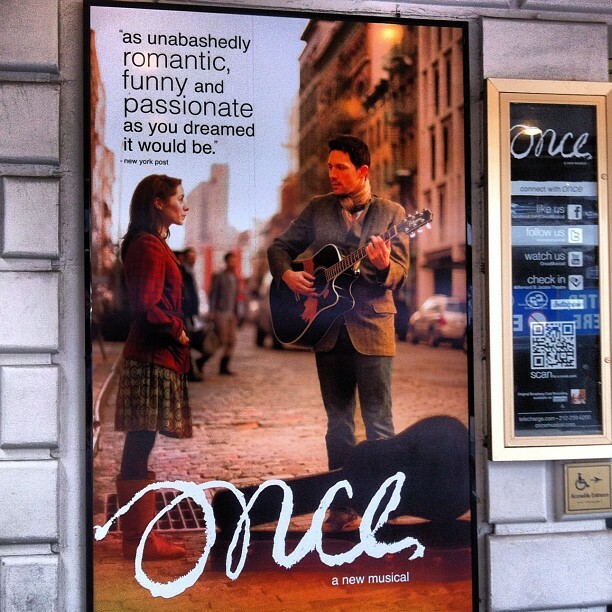 I loved 'Falling Slowly', 'When Your Mind's Made Up', 'Star Star' and 'Leave'. Scrap that, I loved all of the songs! 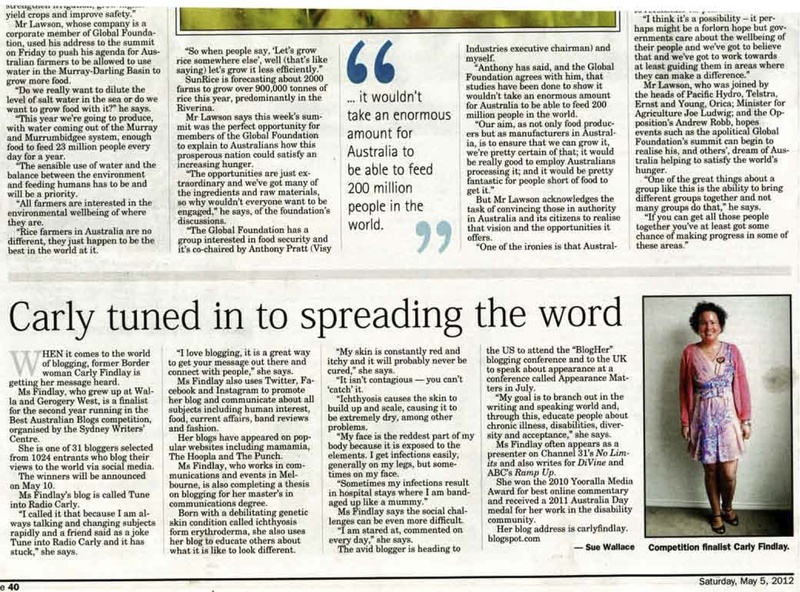 He indicated embarrassment that the ads for his tour placed him front and centre, and gave lots of credit to his band The Frames, part of which have been playing together for many years. The Frames were made up of percussionists, a keyboardist, a brass band, a string set and guitarists. It was a wonderful arrangement. Glen, with a bushy ginger beard (noting during the show that his mate and he grew big beards last year - "beards that said "I hate women") told lots of anecdotes on the stage. He's really proud of his Irish heritage and talked about the way Australian celebrate St Patrick's Day. He was very funny. He also talked of a friend dying of cancer, biut living his last six months to the fullest, and dedicated a song to him. They played for almost three hours, Glen said that "we wrote a long list of songs, and played a longer list". After one encore, a few of his band members and he did an acoustic set on the edge of the stage. Below is a picture of everyone doing a cover of Leonard Cohen's passing Through. The previous night, the band played in a procession through the foyer and took the audience onto the street (see video at the end of this post). 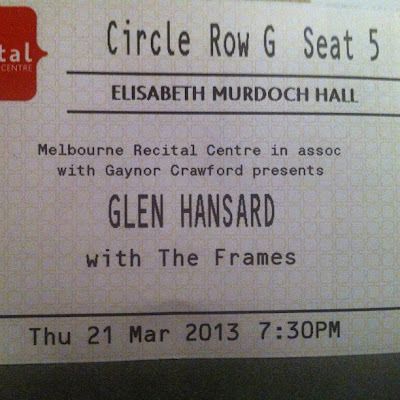 I loved the way Glen Hansard gave it his all. He is such a passionate performer. And my other favourite thing was his interpretation of covers - a R.E.S.P.E.C.T at the end of 'Love Don't Leave Me Waiting' was fun, and the string players' renditions of 'Twinkle Twinkle Little Star' and the 'Willy Wonka World of Your Imagination' song were magic. Glen Hansard can whisper and he can roar. His voice is electric, and as I expected, I felt it through to my bones and soul. The concert left me feeling alive. This is what music is about. Ok now I'm feeling super DUPER awful that I missed this. Boo hoo!! (Too close to my Sydney trip last week.) I bloody LOVE Glen Hansard and his wily anarchistic talents. Two years ago in March I saw him with The Swell Season and my oath they were magnificent. In the intimacy of St. Kilda's Palais theatre their melodical persuasion, generosity and big chunks of audience participation made it an uplifting and almost spiritual experience. Oh, and the small, screen print-style tour poster exclusive to Australia- sheer magnificence! Oh I am SO so disappointed that I didn't even know he came to Melbourne! Once is one of my favourite movies, and I'm in love with the songs! It must've been fantastic to see. I wonder if the musical would ever come to Melbourne too.